Branding is an issue that every business, for-profit and non-profit, must actively deal with. Why? Branding is critical to helping customers remember your business when they need your products or services. The core goal of marketing is to amplify your branding to bring in new customers; without a consistent brand message, that can’t be done. It’s important to realize that consistency is key in building brand identity. Think of some of the major brands in our world today – Coca-Cola, Home Depot, or Delta Air Lines. They are very consistent in the way they use their logo, the way they use their name, and the colors they use. For instance – Cola-Cola. Everyone knows that Coca-Cola red is a certain PMS color and anything that isn’t that color doesn’t meet their brand standards. They go to great lengths in protecting those brand standards because it is something that sets them apart from their competition. Even if you’re a small business, you can build brand identity and build it in a way that customers will remember your business when they need you. There are many ways to build your brand by marketing your business. One way to do it is through physical signage. 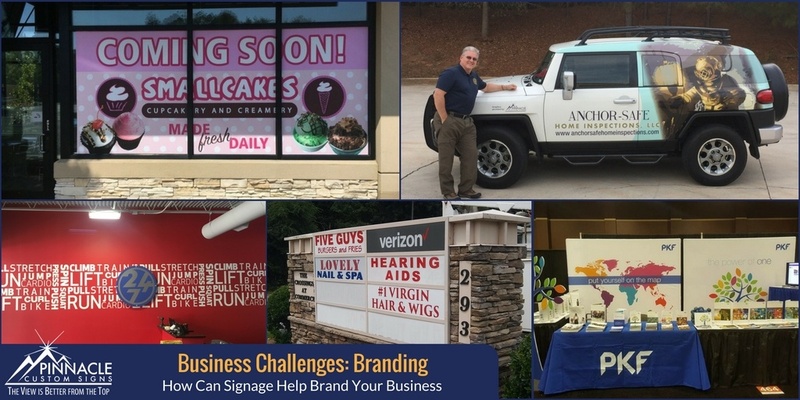 When you think of outdoor signs, the first thing that comes to mind is building signs. 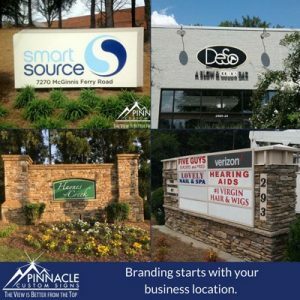 If your business has a physical location that is open to your customers, you will want to identify that building in some way. These types of signs often use your company’s logo and name, but may also just use your business category, like “Travel”. Ideally, you should include your company’s logo and name into your signage. Dimensional signs are often used because of the versatility and affordability. You can create a dimensional sign using lettering and your logo with or without lighting. Checking with building codes and municipality rules is important to ensure that any guidelines are met. You’ll often see channel letter signs being used above retail stores in most shopping centers. Single-tenant buildings will often have a monument sign at the road. This gives you even more space to identify and brand your business’s location. You can do that with more than just the logo and text. Consider what materials you use and the shape of the sign – presentation is important. Multiple tenant buildings often have marquee signs that will allow you to add your information to it. While not as large as a monument sign, every space counts. The more a customer sees your logo, the more they will remember you. Interior signs will be different depending on the type of business. A retail business will use a combination of wall graphics, hanging signs, freestanding signs, A-frames, banners, and point of sale signs. When designing these signs, it’s important to remember your branding; using your brands color schemes and design elements will help reinforce your branding in your customers’ minds. Even if you can’t include your entire logo in a sign, you can include elements which tie in with the rest. Businesses that are more service based, like lawyers, doctors, and banks, will have signs that are different from retail businesses. Usually, they will have lobby signs that use the business’s logo to reassure visitors that they are in the right location (and to expose them to the brand again). They may use wall graphics or window graphics to highlight essential services, happy customers, or motivational/informative information. Some businesses will use banners to promote new offerings, like a bank advertising free checking. 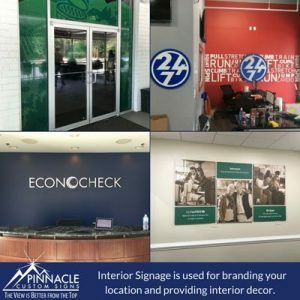 Interior signs can be made from a variety of materials that are more cost-effective because they will not be exposed to the elements like outdoor signs. When talking to a sign company about your signage needs be sure to explore all your options. For service companies where you go to the customers versus the customers coming to you, vehicle graphics are an excellent way to build brand identity. 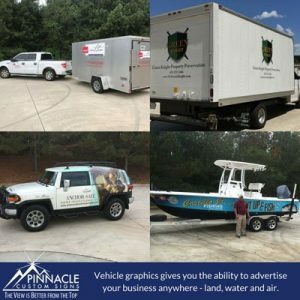 It is often the most cost-effective way of advertising your business because you build your brand identity wherever that vehicle goes. As you drive to your job sites, people will notice you and start to remember you. When they need your services, they may remember you or see your vehicle on the road and give you a call. All because they’ve seen you out on the roads while you’re going from place to place to service your customers. 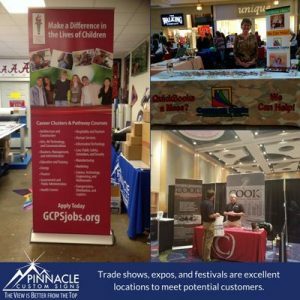 Another way to help build brand identity is by attending trade shows or expos or festivals as a vendor. When you go to these things, you could have a branded table cover or, if you’re doing an outdoor festival, a branded tent. Backdrops at a trade show often give you lots of room or space — we like to call it real estate — to put your brand out there. Having a branded, eye-catching booth will help people see you. Even if they don’t interact with you at the event, they may remember you later on. Again, the key is to have your branding wherever you are so that more people who see it and will remember you – not your competitors – when they need your product or service. Whether it’s a small business or a large corporate building, a school campus or a service business, every business needs to build its brand and will have some form of signage. When it comes time for you to consider new signage or updating existing signage, give us a call or contact us online. View related video here. | View related slide deck here.